US crude oil and petrochemical refining capacity in Texas has been severely damaged by Hurricane Harvey, releasing hazardous pollutants into the air and flood waters left in the wake of the storm. Arkema, a global chemical major, warned Wednesday that flooding has severely damaged their Houston plant's refrigeration systems, increasing the likelihood of an explosion in the coming week and a heightened risk of yet more pollutants leaking into the ecosystem. “At this time, while we do not believe there is any imminent danger, the potential for a chemical reaction leading to a fire and/or explosion within the site confines is real,” Arkema said in a statement. Oil giant Exxon Mobil is among the companies to report incidents of emissions released at its refineries as a result of the hurricane which ransacked coastal parts of Texas and caused widespread flooding in the country’s fourth biggest city, Houston. However, the true extent of the air pollution will prove hard to determine for some time after the storm subsides as The Texas Council on Environmental Quality shut down all of its air quality monitors in the Houston area, according to the Houston Press. This effectively means the affected companies can report whatever they wish without any oversight from the state regulators. Texas is also home to several so-called superfund sites, designated areas of extreme pollution "which warrant further investigation" according to the Environmental Protection Agency. As shown in the before and after maps below, the vast majority of these toxic sites are now flooded in the aftermath of Hurricane Harvey. On Wednesday, Saudi-owned Motiva shuttered its refinery in Port Arthur, Texas, the largest facility in the US, which normally produces 600,000 barrels a day. At least 13 other refineries in the area closed as a result of Harvey, the US Department of Energy reported, while others are operating at limited capacity. Exxon admitted there were issues at its plants in a regulatory filing to the Texas Commission on Environmental Quality. Its Baytown refinery near Houston, the second-largest in the country, was shutdown on Sunday as Harvey moved inland. The refinery reported two controlled emission release events, which included carbon monoxide, nitrogen oxides, sulfur dioxide and benzene being released into the atmosphere. The chemicals and pollutants released from refineries and plants in Texas’ petrochemical hub are known to have a damaging effect on the environment and could pose a risk of contaminating floodwaters left in the hurricane’s wake. The petrochemical Benzene, a carcinogen and major component in fossil fuels, reduces red and white blood cell production and decreases auto-immune cell function following prolonged exposure. While other emissions, including, sulfur dioxide and nitrogen oxides are particle-forming air pollutants that contribute to cardiopulmonary health issues, like lung cancer, bronchitis and emphysema. In a third reported incident since Harvey made landfall in Texas, Exxon said a floating roof over a tank in its Baytown refinery sank as a result of the rain, causing unusually high levels of emissions to be released. Floating roofs are common in oil tanks and are a way to control how much oil is lost to evaporation by allowing the roof to move based on the amount of liquid in the tank. Exxon said it would “conduct an assessment to determine the impact of the storm once it’s safe to do so,” the Washington Post reports. 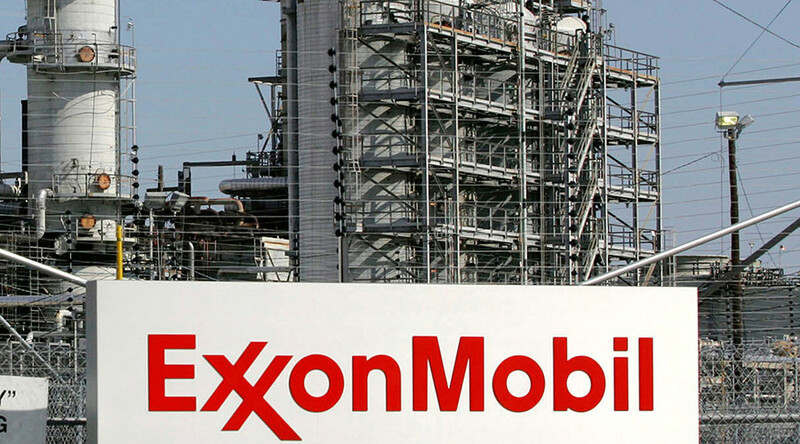 The company said it needed to make repairs on the tank, which would involve first emptying it, though Exxon could not confirm in what time frame. One of the company’s other facilities, in Beaumont, east of Houston, also released 1,300lbs of sulphur dioxide in one hour on Sunday, exceeding its allocated emissions limit by a factor of ten to one. “Excess emissions occurred during an upset on the Sulfur Plant Thermal Oxidizer,” Exxon said in the report. Petrochemical giant Chevron Phillips reported an estimated 776,000 pounds of combined chemicals released from its Cedar Bayou plant in Baytown as part of its plant shutdown. Kinder Morgan, the largest energy infrastructure company in North America, stores petroleum products for companies such as Chevron and Shell at its terminal in Pasadena, Harris. It reported 394,000 pounds of combined hazardous chemicals on Sunday and Monday, also as a result of a malfunctioning floating roof. In this case, it caused product to spill to the ground. Almost one third of US oil refining capacity is located on the Gulf Coast. The US produces about 17.5 million barrels of oil per day. According to oil market analysts cited by CNBC, about 20 percent of the country’s oil refining operations are out of service. Ships carrying crude oil from the Mexican Gulf are not able to port in the area due to swelling waters caused by Harvey, resulting in a backlog of ships waiting to dock and unload their cargo. The Gulf of Mexico accounts for close to 20 percent of total US crude oil production. CNBC estimates the port closures cost roughly $350 million a day. The port hold-up also affects the amount of crude oil refineries have access to once they return to full operation. Gas prices across the US have already risen to a two-year high, with the increase likely to hit consumers at the pump in a week. It is unknown how long the refineries will remain out of production, as the extent of flood damage is not yet known. Following Hurricane Katrina in 2005, refineries in the area didn’t return to normal production capacity for two months.